While there are twelve distinct tones to choose from in western music, similar to spices in a recipe, most musicians/cultures choose to incorporate only five to eight. The reason for this is that it creates musical interest. Imagine playing every single note on the guitar. There would be no focal point and together all of the notes would sound muddy. 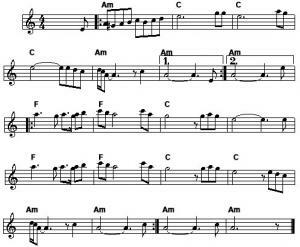 When a few notes are omitted, emphasis becomes shifted to specific tones. The formula for what notes are omitted and what are kept, entirely depends on where in the world you reside. Western musical scales tend to focus on seven specific notes out of the twelve. These notes are often referred to as the diatonic (or natural) scale and they follow a strict formula with respect to the intervals between them. Since there are 12 notes in western music, this formula could be achieved twelve different ways, or keys, by starting on a new note every time. To simplify things, here is an example of the the seven notes in the Key of "C"
The diatonic scale is the single most important tool used in creating scales, chords, and musical composition. It is the backbone of guitar & music theory.